Save on Candles at Sonoran Sunrise Grove. Top brands include Stand Around Creations, & Touched By The Saints. Hurry! Limited time offers. Offers valid only while supplies last. Premium 100% Soy Apothecary Candle - 16 oz. - Red Velvet Cake - A decadent blend of chocolate cake w/sweet cream cheese frosting. Premium 100% Soy Candle - 6 - oz. Hex Jar- Amish Quilt - Spicy, sweet w/Vanilla w/ cinnamon, clove, allspice w/ sugar. Premium 100% Soy Apothecary Candle -16 oz.- Vanilla Lace And Pearls- A blend of French vanilla w/vanilla w/sweet flower and musk. 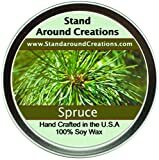 Premium 100% All Natural Soy Candle - 8 oz Tin Spruce - Capture the spirit of the holidays w/ this strong, true, and enchanting scent. Contains natural cedarwood and pine essential oils. Premium 100% Soy Apothecary Candle - 16 oz. -Green Tea and Lemon Grass: Bright and natural citrus begins w/notes of bergamot tea and plum w/jasmine and orange flowers w/a clean citrus musk. Premium 100% Soy Apothecary Candle - 16 oz Double Wicked- Wedding Cake - A decadent blend of moist vanilla cake, cane sugar and creamy white frosting. Premium 100% Soy Apothecary Candle -16 oz. - Vanilla Sandalwood - A beautiful combination of luscious rich vanilla, and Indian Sandalwood. 100% All Natural Soy Candle- 16 oz. - Pine Cones - The scent of a fresh cut pine bough. Notes of balsam w/ patchouli combine w/ natural spruce and cedar oils. 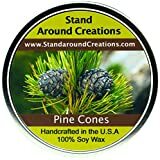 Premium 100% Soy Candles- Set of 2 - 2 oz Tins Spruce: The scent of Frasier or Douglas Fir .Made w/ pine essential oils. 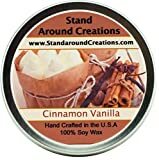 Premium 100% Soy Candle - 6oz Tin - Scent: Cinnamon Vanilla - The scent of spicy cinnamon w/ sweet vanilla. Premium 100% Soy Apothecary Candle - 16 oz.- White Chocolate - The aroma of creamy cocoa butter, marshmallow, white chocolate, and vanilla beans. Premium 100% Soy Apothecary Candle - 16oz. - Fireplace: A woodsy, earthy aroma. True to it's name.